The Game Bone deformation is very similar to the Bone deformation. It allows you to create a bone-like structure in which each part is solid, but with articulations that are flexible. This is mostly useful for animating a character's limbs, such as the arms or legs, or other parts that can be articulated such as torsos or fingers. For example, a Game Bone deformation can be used to articulate an arm that is made of a single drawing, so that the upper arm and forearm can be moved independently, without having to draw the upper arm and the forearm on different layers. Harmony will deform the drawing to make it look articulated. 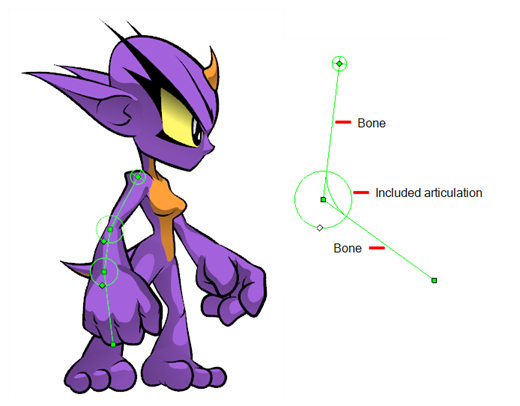 The different parts of a Game Bone deformation can be rotated around their joint, extended and shortened, giving you the same capabilities as animating articulations on different layers, without having to worry about parts detaching, pivot points, or clipping outlines. The Game Bone deformation is different from the Bone deformation in which it is optimized for game engines such as Unity. Hence, it is usually only used for game development and not in animated productions. The difference between the Bone and Game Bone deformations is that Game Bone deformations do not have a Bias property. The articulation folds also look slightly more rounded.